In the late 1980s, many physicians “rediscovered” the SI joints as a possible source of back pain. Yet even today, SI joint pain is often overlooked. Many physicians have not been trained to consider it. Many are still reluctant to believe a joint that has so little movement can cause back pain. In order to understand your symptoms and treatment options, it helps to begin with a basic understanding of the anatomy of your low back. This includes becoming familiar with the various parts that make up the lumbar spine and how these parts work together. 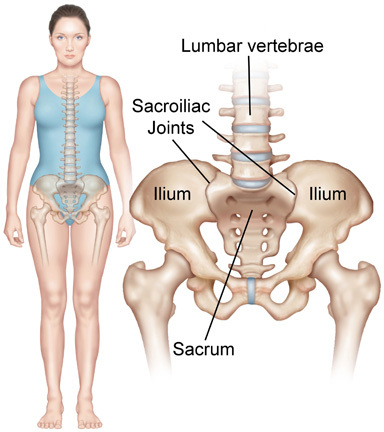 There are two sacroiliac (SI) joints in your pelvis that connect the sacrum (tailbone) and the ilium (large pelvic bone). The SI joints connect your spine to the pelvis, and thus, to the entire lower half of the skeleton. Like any other joints, there is articular cartilage on both sides of the SI joint surfaces. But unlike most other joints, the SI joints are covered by two different kinds of cartilage. The articular surfaces have both hyaline (glassy, slick) and fibrocartilage (spongy) surfaces that rub against each other. The joints also have many large ridges (bumps) and depressions (dips in the surface that fit together like a puzzle). The SI joints are also unique in that they are not designed for much motion. It is common for the SI joint to become stiff and actually “lock” as people age. The SI joint only moves about two to four millimeters during weight bearing and forward flexion. This small amount of motion occurring in the joint is described as a “gliding” type of motion. Due to the small amount of movement and the complexity, finding out about the SI joints’ motion is very difficult during a physical exam. The SI joints are viscoelastic joints, meaning that the major movement comes from giving or stretching. This motion is quite different than the hinge motion of the knee or the ball and socket motion of the hip. The main function of the SI joints is to provide shock absorption for the spine through stretching in various directions. The SI joints may also provide a “self-locking” mechanism that helps you to walk. The joints lock on one side as weight is transferred from one leg to the other. Many problems can lead to degenerative arthritis of the SI joints. It is often hard to determine exactly what caused the wear and tear to the joints. One of the most common causes of problems at the SI joint is an injury. The injury can come from a direct fall on the buttocks, a motor vehicle accident, or even a blow to the side of your pelvis. The force from these injuries can strain the ligaments around the joint. Ligaments are the tough bands of connective tissue that hold joints together. Tearing of these ligaments can lead to too much motion in the joint. The excessive motion can eventually lead to wear and tear of the joint and pain from degenerative arthritis. Injuries can also cause direct injury of the articular cartilage lining the joint. This too, over time will lead to degenerative arthritis in the joint. Pain can also be caused by an abnormality of the sacrum bone. The sacrum bone is actually a very specialized set of vertebrae. When your body is undergoing development in the womb, several vertebrae fuse together to form the sacrum. In some people the bones that make up the sacrum never fuse together. In these cases, two or more of the vertebra that should fuse together remain separated. This creates an odd situation where the SI joint is malformed and a false joint occurs (sometimes called a “transitional syndrome”). This abnormality can be seen on X-rays. People who have this syndrome seem to have more problems with their SI joints, as well as back pain that appears to come from that area. Women are at risk for developing SI joint problems later in life due to childbirth. Female hormones are released during pregnancy that allow the connective tissues in the body to relax. The relaxation is necessary so that during delivery, the female pelvis can stretch enough to allow birth. This stretching results in changes to the SI joints, making them hypermobile (extra or overly mobile). Over a period of years these changes can eventually lead to wear-and-tear arthritis. During pregnancy, the SI joints can cause discomfort both from the effects of the hormones that loosen them and from the stress of carrying a growing baby in the pelvis. The more pregnancies a woman has, the higher her chances of SI joint problems. The diagnosis usually begins with a complete history and physical exam. Your clinical exam may include the following orthopedic tests used to determine if the SI joints are involved. Pain during these tests is generally an indicator that the SI joints are indeed a problem. Distraction Test – The doctor stresses the SI joints by attempting to pull them apart a bit. Compression Test – The two sides of a joint are forced together. Pain may indicate that this SI joint is involved. Gaenslen’s Test – The examiner will have you lie on a table with both legs brought up to the chest. You will then shift to the side of the table, so that one buttock is over the edge. The unsupported leg drops over the edge and the supported leg is flexed. In this position, SI joint problems will cause due to stress to the joint. Patrick’s Test – The heel of one leg is crossed on top of the opposite knee, and the top knee is pressed down to test for hip mobility and pain. X-rays may also be recommended by your provider to determine if there are abnormalities of the joint. A bone scan can be useful in determining if the joint is inflamed. An inflamed SI joint usually shows up as a hot spot on a bone scan of the pelvis. Your doctor may also recommend that you undergo a fluoroscopic injection into the joint. During this test, a local anesthetic is injected into the joint. The doctor uses the fluoroscope to make sure the needle is actually in the joint before injecting the medication. The SI joints are located fairly deep in the upper buttocks and are covered by thick muscle. It is difficult to put a needle into the joint without some guidance. A fluoroscope is a special TV camera that uses X-rays to allow the doctor to see on the screen the exact placement of the needle and to make sure it is positioned accurately. Once the needle is in the right place, anesthetic is injected to numb the joint. If the pain goes away, your doctor can be relatively sure that the problem is coming from the SI joint and not somewhere else in the spine. The doctor may also add a dose of cortisone to the injection to help ease the pain. Cortisone is a powerful anti-inflammatory medication that calms the arthritis inside the joint and reduces pain. The effect is usually temporary, but may last up to several months. Treatment choices depend on whether the SI joint is stiff or loose. A stiff or “locked” joint responds best to mobilization, a form of stretching used to improve joint movement. Along with hands-on techniques used by the therapist, mobilization includes specific exercises to improve SI joint mobility. For conditions where the joint is too loose, such as arthritis or SI ligament injuries, stabilization treatments are chosen to hold the joint in correct alignment. Stabilization exercises involve posture and muscle training. A sacroiliac belt may be issued to help stabilize a loose and painful SI joint. The belt wraps around the hips to squeeze and hold the SI joints together. This supports and stabilizes the pelvis and the SI joints. 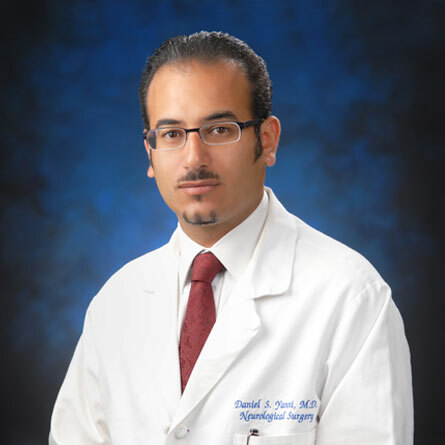 Learn more about back and neck braces. Surgery may become an option if all conservative methods of treatment fail. Surgery on the SI joint usually consists of a fusion of the joint (also called an “arthrodesis”). Fusing the two sides of a joint together to reduce pain has been used for many years as a treatment for arthritic joints. An incision is made over the SI joint in the lower back. The joints are opened so the surgeon can see each joint surface. The articular cartilage lining the joints is removed from both surfaces. This leaves a fresh surface of bone instead of the normal cartilage. The bone surfaces are then held together until they heal or fuse. Without the articular cartilage of the joint, the body treats the two raw bone surfaces just like a fracture, and tries to heal them like any broken bone. To hold the bones together, the surgeon will usually insert several metal screws across the joint. Bone graft may also be placed around the joint to help fuse it. The bone graft is usually removed from the pelvic bone right beside the SI joint.